ALEXANDRIA, VA -- (Marketwired) -- 07/26/13 -- Easing the burdens of diabetes is a big part of the American Diabetes Association's mission. That's a goal of the Safe at School® campaign, which works to ensure students with diabetes receive the care they need and a fair education. 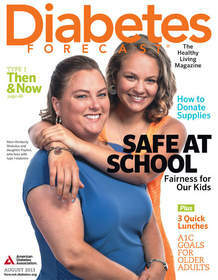 The August issue of Diabetes Forecast, the Association's Healthy Living Magazine, illustrates how volunteer advocates can help resolve disputes with schools, plus how parents can help draft critical 504 plans to protect their children. Lessons Learned: Under federal law, all schools that receive federal funds are required to provide services for children with diabetes. Having rights is one thing, but having a school acknowledge them is another -- and parents who don't know their children's rights may take schools at their word. The magazine features the journeys of two families that enlisted help from the Association's legal advocates, including Kimberly Shekalus, who fought for more than three years to keep her daughter, Payton, safe at school. Get Schooled on 504 Plans: A 504 plan is a legal document designed to ensure that students with a condition such as diabetes can manage their health at school and receive the same education as other kids. But many parents do not know when or how to get started. From determining a child's eligibility to outlining the specifics of his or her diabetes care, Diabetes Forecast has the 411 on developing 504 plans. Tips for donating unwanted diabetes supplies. Considering whether fasting is a safe and reasonable option for people with type 2 diabetes. Should seniors keep very tight glucose control? Grab-and-go meals that are both colorful and calorie-smart. Celebrating the 30th anniversary of the most influential diabetes study to date. Diabetes Forecast has been America's leading diabetes consumer magazine for more than 60 years, offering the latest news on diabetes research and treatment to provide information, inspiration and support to people with diabetes. The American Diabetes Association is leading the fight to Stop Diabetes® and its deadly consequences and fighting for those affected by diabetes. The Association funds research to prevent, cure and manage diabetes; delivers services to hundreds of communities; provides objective and credible information; and gives voice to those denied their rights because of diabetes. Founded in 1940, our mission is to prevent and cure diabetes and to improve the lives of all people affected by diabetes. For more information, please call the American Diabetes Association at 1-800-DIABETES (1-800-342-2383) or visit www.diabetes.org. Information from both these sources is available in English and Spanish.